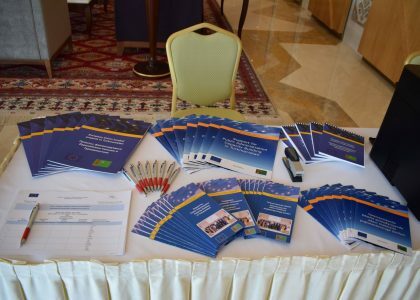 In the period from 5th to 9th December, the EU funded project “Support for Public Administration Capacity Building in Turkmenistan” organized a working visit to the Republic of Kazakhstan. The visit was organized under the Component 1: “Institutional development: Enhance the institutional and coordination capacities of the Academy of Civil Servants” and under the Component 2 “Capacity Building: Strengthen the capacities of the Academy of Civil Service under the President of Turkmenistan (AoSC) and state bodies to provide demand driven training”. The visit was conducted as a follow up to the international conference in Avaza, during which successful experience in development and delivery of Master is in Public Administration programmes in Germany, Lithuania, Bulgaria and Kazakhstan was shared and discussed. 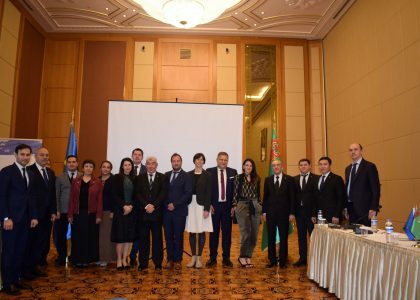 After the Conference, a Working Group, consisting of professors and lecturers from the Academy of Civil Service under the President of Turkmenistan and other educational and governmental institutions was established and held. 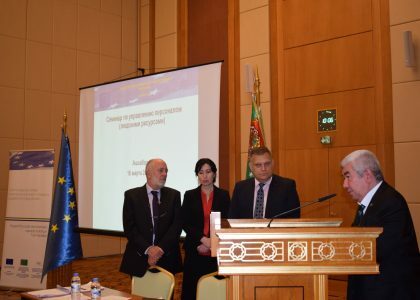 The members of the Working Group discussed and agreed the modules of the MPA program, proposed by the project, as well as potential candidates, responsible for the curriculum development in particular areas. The dates and the program of the working visit to the Republic of Kazakhstan were considered and agreed. In addition, by a proposal of the Rector of the Academy, it was agreed to divide the working visit into two rounds with the aim to enable Turkmen professors and lecturers to get better understanding of the structure, requirements, curriculums, and mechanisms for internal and external quality assurance of the MPA programmes delivered in Kazakhstan. The main objective of the visit was to explore in-depth the Kazakh model of Master’s programmes for civil servants and to proceed with the development of curriculums for the Turkmen Master’s programme using the experience of Kazakhstan and starting the development of the curricula for the respective modules. The MPA program is intended for Turkmen medium level civil servants seeking to obtain a comprehensive education and in-depth knowledge of public administration, as well as a basis for obtaining full and necessary organizational skills and skills in the field of public administration. During the visit, the Turkmen group had 5-day intensive sessions, including interactive discussions, on-line sessions, trainings, case-studies and practical work on the development of the curricula in the Academy of Public Administration under the President of Kazakhstan and Nazarbayev University. The sessions were held under the supervision and expertise of Kazakh professors, Rector and Vice Rector of the Academy of Public Administration under the President of Kazakhstan and the Key experts of the Project. 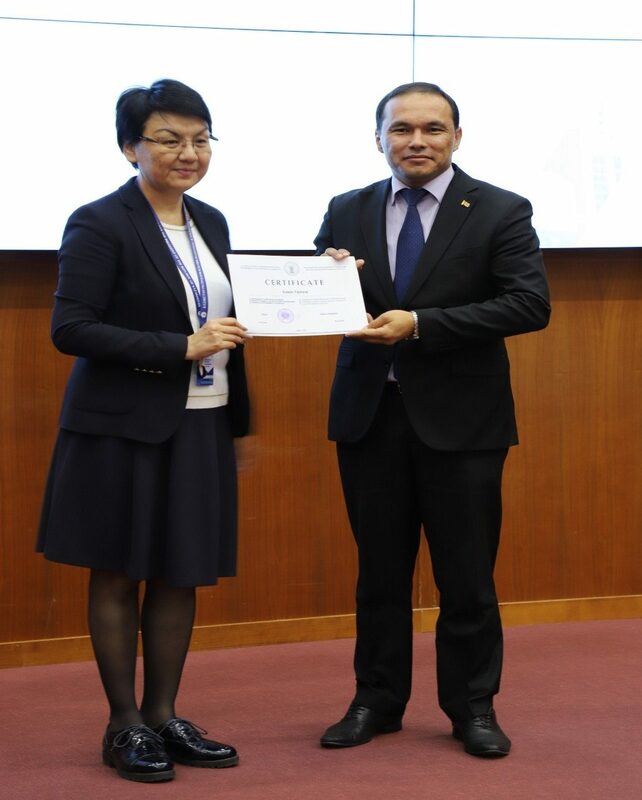 The members of the Turkmen delegation received comprehensive information related to different aspects of the Kazakh Master’s programmes in the field of Public Administration. As a result, participants of the Turkmen delegation drafted the structure and academic calendar for MPA program. It consists of 120 ECTS credits with the core and elective courses, including the internship and internship phase. Moreover, during the 5 days the group developed the first drafts of curriculums for the following selected modules of the Master’s programmes in public administration: Administrative law, Strategic planning, Ethics of civil servants, E-government, Organizational management. (The draft curriculums are available upon request). The working visit and its outcomes were highly appreciated by the Rector of the Academy of Public Administration under the President of Kazakhstan. At the end, all the participants were awarded with Certificates of participation. 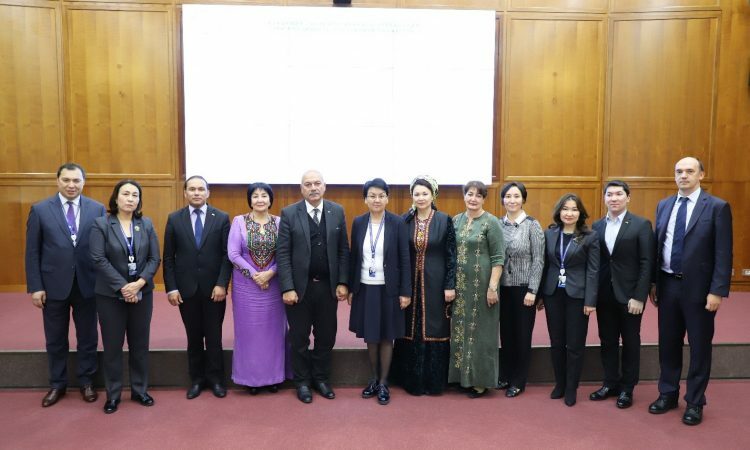 After the working visit, a presentation on its results was organised in the Academy of Civil Service under the President of Turkmenistan with participation of the project staff and management of the Academy. The members of the working visit presented the draft curricula. Recommendations regarding finalization and modification of the curricula, online consultations and organisation of additional visit to Kazakh Academy with the aim to attend the interactive lessons of Kazakh colleagues were made. 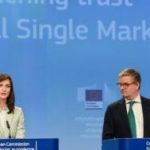 The action plan of the 2nd round of the working visit was discussed. Preliminary date of the 2nd visit is the 2nd half of January 2019. In addition, a visit of Kazakh experts to Ashgabat is scheduled to attend a working group meeting and conduct individual consultations with academy teachers, responsible for the curriculum elaboration.